I woke up suddenly at 2.10am feeling sick, and I've spent the last 2 hours or so on the toilet, sharing my dinner with the plumbing system. Yes, it could be a bad pie, but I doubt it. It's just nerves, brought on by the glorious monstrosity bureaucracy called the South African Revenue Service. I'm told with great earnestness by friends that one should never criticise SARS in public, or complain to the media about them. They could get really nasty and make my life a misery with tax audits and stuff. But no one can explain to me what to do about the trifling amount of R246,231.46 that they claim I owe them. To put that into perspective, it's 118% of my taxable income for 2011, or 55% of my gross annual turnover. R113,344.31 of this amount is interest, and it is growing by R1,168.39 per month. At one stage the interest rate of 15% meant the amount grew at R2,316.87 per month. Any way you look at it, it's a daunting amount of money. My body reacts to this stress by making me sick. It's kept me awake for the last 2 hours. The sad thing about this whole deal is that it should have been sorted out in 2008 when I was granted amnesty by the "Small Business Tax Amnesty" legislation. This was supposed to write off all the taxes payable for the 2003-2005 tax years. However they failed to inform me of the decision, and then on top of that decided that these tax years were not covered by the amnesty because the tax forms had not been filled in, or some such nonsense. Ever since then I have been getting "Final Demands" (I've had several) from the tax collection section of SARS. Each time I get one it makes me sick for a few days. Yesterday I went to see them because (surprise, surprise) they had lost an objection I filed in May 2010 and now that they were looking at the copy I resubmitted they decided that I should have signed it and not the accountants that did it on my behalf. This little delay has cost me R16,000 in interest, not to mention time wasted with the accountants, plus the accountants' fees. In order to pay this amount I have to earn R22,900 so that I can pay 30% tax on that to be left with R16,030 in order to pay this tax. And I'm still no closer to paying off the capital that generated the interest in the first place. 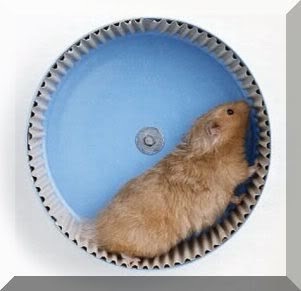 I feel like a hamster in a wheel.